We all know the loyalty of dogs. At our sides through thick and thin, never judging or deserting; dogs really are a man’s best friend. But there is one dog whose loyalty knows no bounds. Hachiko, known in Japanese as chuken Hachiko (“faithful dog Hachiko”), was a white Akita dog belonging to a professor at the University of Tokyo, Hidesaburo Ueno. Every morning from 1924-1925, the pair would walk together to Shibuya Station in Tokyo, where Ueno caught the train to work. When he returned in the evenings, Hachiko would be there waiting for him and the pair would accompany each other home. This continued until one day in May, 1925 when Ueno failed to return from work. Unbeknownst to Hachiko, his master has suffered a fatal cerebral haemorrhage and would never be coming home. But this didn’t deter faithful Hachiko who continued to appear at Shibuya Station every evening just as the usual train pulled into the platform. For nine years, nine months and fifteen days, Hachiko waited for Ueno. Eventually commuters started to notice Hachiko’s regular presence at the station and began offering him food to sustain him while he waited. He also attracted the attention of station staff and people began talking about him in popular publications. One of Ueno’s past students, Hirokichi Saito, decided to follow Hachiko from the station one day and ended up at the home of Professor Ueno’s gardener. Here he learned the incredible story of Hachiko and began publishing articles about the Akita’s unceasing loyalty. From there, Hachiko became a national symbol of love and loyalty and was thrust headfirst into the public spotlight. Everyone wanted a piece of the dog that had held vigil for his master for nearly a decade. As awareness of the Akita breed increased, so did its popularity, with people desiring a dog that could show such devotion. However, purebred Akitas were hard to come by. Saito conducted research over many years and found that, including Hachiko, only 30 purebred Akitas remained in Japan at that time. In April 1934, a bronze statue was raised at Shibuya Station to honour Hachiko and his faithfulness. Hachiko was present at its unveiling, however, during the Second World War, the bronze was recycled as part of the war effort. A new memorial statue was erected in August 1948 by which time, Hachiko had sadly passed away. Hachiko died on the 8th March, 1935. He was found on a street in Shibuya and his master's wife, along with station staff, went into a state of mourning. It wasn't until 2011 that the cause of Hachiko's death was confirmed. 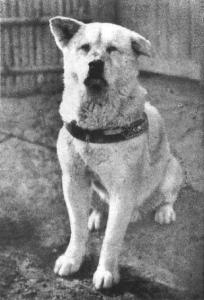 It is believed that Hachiko had terminal cancer, as well as a severe heartworm infection. Today, his preserved remains can be found at the National Science Museum of Japan in Tokyo. Beautiful story. I saw it in TV time ago and makes me cry a lot. I remember that some days after I continue feeling sad. Poor dog so faithful to his owner. They are the best that could happen to us in the life! I knew I shouldn't have read the story. I am always amazed by the love of these beautiful creatures. i would love to think Hachiko is back with his master. A very moving story indeed. The love many a dog has for its owners is almost beyond belief. Cried endlessly at the film. My dog Sonny "cried" for 3 weeks after his Mum died, my other dogs over the year have also mourned their lifelong partners. I saw the film, it was so sad, I cried so much and I am on the verge of crying when I tell; the story to people. I am only glad that my dear faithful unique Labrador retriever (he died nearly 16years old) did not have to suffer a loss. I now enjoy the company of my Lhasa Apso now almost 15 years old. It never amazes me,just how intelligent our dogs are. I have a jack Russell called Ellie, she no's when I'm down, sad,happy, and when I'm hurt & injured. I can sit and tell her anything, & no she understands. She's not only my pet, she's loyal ,doesn't judge me, but most of all, she's my best friend. And I love â¤ her with all my heart. The best things in life are dogs. They bring so much love, joy and friendship. Through hard times and good times their love is never ending.